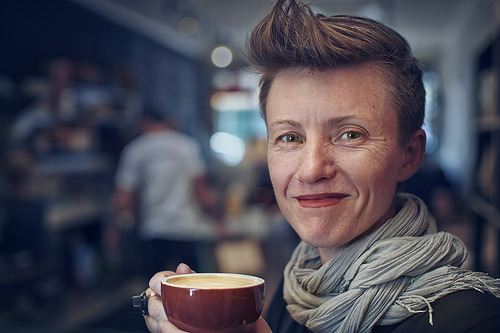 In our first podcast series at Chuffed.org, we're looking at social enterprise, STREAT's first crowdfunding campaign, where they took a $4,000 donation, made it into an $80,000 campaign and built a $160,000 cafe. As this is our first go at podcasts, we'd love your feedback in the Facebook comments below. Enjoy! Rebecca: This woman came to us really, really early. I think it was 2011. She just popped up in the middle of nowhere. She was doing her own cookbook. It was on different cafés and restaurants that were in Melbourne. It was called Flavours of Melbourne. And she saw our little food cart at Federation Square and she said, "I'd really like to feature you guys in there and put just a little forward to you and telling people about who you are." So, even though her cookbook was featuring all these really high end restaurants and cafés, she put this story about us in that cookbook and then did a fundraiser for us at the launch of that cookbook. And that fundraiser raised $4,000. So, at the end of it, she came to me and said, "I've got $4,000 for you. It would be fantastic if we could make that money stretch even further. Imagine if we worked with you now to make your own cookbook. Because then, if you made your own cookbook, we could turn that $4,000 into lots more than that." So, the $4,000 in producing a cookbook doesn't go very far. It's a really expensive process. So yes, she was going to use it against the printing costs but we still had to come up with tens of thousands of dollars which we just didn't have. Prashan: For most of us, the idea of turning $4,000 into tens of thousands of dollars in the space of a few months sounds impossible. But when you’re on a mission, like Bec Scott was – what’s possible doesn’t really come into play. Today, the story of how Bec and her team turned that $4,000 into not ten, not twenty but eighty, thousand dollars – and how they created one of Australia’s most loved cafes in the process. I’m Prashan Paramanathan. This is our first podcast at Chuffed.org. Stay tuned. In the early 2000s, Bec Scott found herself in Hanoi, Vietnam. She sat down at a café and ordered a quintessential Vietnamese dish – rice paper rolls with tamarind sauce. And as she waited for her rice paper rolls to come out, she noticed a postcard on her table about the café. Now most cafes find creative ways of describing themselves but this one used a phrase that Bec hadn’t really come across before – remember this is early 2000s – the café described itself as a ‘social enterprise’ working with homeless young people. The next time the waiter came by, Bec struck up a conversation. The café she was in was called KOTO – an acronym for ‘Know One Teach One’ - and was founded by a Vietnamese-Australian, Jimmy Pham. Jimmy grew up in Australia but returned to his native Vietnam for the first time as a 24 year old. He was struck by the thousands of street kids – the ‘dust of life’ in Vietnamese – and like many of us, he wanted to do something to help. Instead of building an orphanage or starting a charity, Jimmy did something else – he asked the kids what they wanted out of life. Their reply – ‘we need skills so we can find stable jobs’. So Jimmy started up what ended up as KOTO – a hospitality training program, housed inside a café/restaurant – where street kids could get trained in hospitality skills, work in the café and then graduate into a hospitality career. As Bec was eating her rice paper rolls, the power of the model struck her – her rolls were training up a street kid and getting them out of poverty. In 2004, Bec spent two years volunteering at that café in Vietnam – KOTO with her partner Kate Barelle. And then, in 2009, Bec and Kate landed in Melbourne Australia, took what they had learnt from KOTO, merged it with their love of South-East Asian hawker food and started STREAT. It was humble beginnings back then – they just had two little coffee carts in Melbourne’s Federation Square. Actually, maybe ‘little’s the wrong word to use. Ian: We had Coffee carts, so big stainless steel barbecues, basically, that were supposed to be mobile, but would take four guys or a truck to really shift. Prashan: That’s Ian, who runs STREAT’s marketing team. Prashan: So two ‘big’ coffee carts. Plonked out in the middle of an open square. In the sun. In the rain. Fun times. After 6 months of that– a property group, GPT, offered STREAT an indoor location for another cart – in Melbourne Central. And they jumped at it. It was 2011, and STREAT was hitting a growth spurt. Then, in 2012, STREAT doubled in size, almost overnight. In one of Australia’s first social enterprise on social enterprise acquisition, STREAT bought two cafes and a roasting company. But that was just the start of it. Rebecca: We, at that stage, had just moved beyond having two little food carts. And we'd just done an acquisition of a couple of bigger businesses. But we were still quite fledgling. We knew that we wanted to grow some more and we had, essentially, one of our landlords at one of our sites come and say to us, "You've been here on month-to-month lease since 2010. Please, we'd love you to sign up to a five-year lease." But we just had no cash in the bank. We've never had any cash in the bank since we started, and so it wasn't like we could just go, "Right, we need a couple hundred thousand dollars." We just re-developed a site. We knew that we were going to need some extra money to be able to make that possible. Prashan: The landlord that Bec’s talking about was the same one that had got them out of the sun and rain at Federation Square. Their indoor cart at Melbourne Central had gone well – their landlord was happy and wanted them to upgrade. Instead of renting a space for their temporary cart, why didn’t they sign up for 5-years and build a café? So it’s now early 2012, they want to start up this new café, they want to publish a cookbook, and they have $4,000 to do both. You know that point in a story where someone makes an offhand comment, that changes everything – well, that happened. One of STREAT’s early investors, Danny Almagor floated the idea of ‘trying crowdfunding’. Rebecca: And I think he said it kind of as a throw-away line, and said, "Oh, well, if you decide to do one, we'll chip in a little bit." And I'd never really considered it before then but it made sense. It felt like we had written a lot of grant applications and it wasn't like it felt like there was new grant money available. But the other thing is, as well, is that to get grant money takes a long lead time normally. We can wait up to six or nine months before submitting a grant application and then knowing at the other end if you've got the money. We just didn't have the lead time on some of that stuff that we wanted. Yeah, we just started to think really creatively, and the more I thought about it, it just kind of made sense. Ian: And Rebecca and I had a look, and thought, "Okay, maybe we could do something and try and raise five or 10,000." Then I looked at it, I thought, "Wow, there's a lot of work in that." You really to have to run the campaign actively, day in, day out, for the campaign period. And I said to her, "Look, if we're going to do this, I'm not going to do it unless we're trying to raise 20 or 40 grand, or something like that." Prashan: So they had a target. Now they just needed a campaign for it. Should they go for funding for the cookbook? Or should they try and fund the café? Bec and Ian’s approach was of course: I wonder if we could do both? Ian: So I came up with this campaign, that basically, "How do we turn a cookbook into a café?" And that was essentially the one-liner that captures our crowdfunding campaign: "How do we turn this cookbook into a café?" At that stage, we didn't have a cookbook, nor did we sort of have a café. Prashan: the idea was pretty simple. Sell the cookbooks on a crowdfunding campaign and use the proceeds to fund the café. That way, they get a cookbook and they get a café. It was their first campaign, and they weren’t going to leave anything to chance. $40,000 is a big target. And they were running an all-or-nothing campaign. If they didn’t hit that $40,000, they’d get nothing. So instead of waiting until the campaign started, Ian did something that at first seems a little sneaky, but actually is really smart. Ian: I wasn't going to do it unless I knew I was really going to get to the 40,000. So I pre-sold 700 or 800 cookbooks to a number of corporates to underwrite the campaign. Basically, I had 20 or $25,000 worth of orders of cookbooks that I could feed into the crowdfunding campaign to make sure we got to our $40,000 target. Prashan: What did that conversation go like? Ian: The conversation with the corporates? Ian: It's like selling something you don't have. So imagine that this is a cookbook in my hand Prashan, and your Chuffed logo is going to be on the front and your page about Chuffed is going to be on the inside. And, it'll have Poe, and it will have recipes from our students but essentially I had a few PDF pictures of some recipes but that's about all. Prashan: The cookbooks that Ian was preselling weren’t just ordinary copies that you could get off the shelf. Ian had a very specific use in mind. Ian: I designed them as a corporate Christmas gift. So if you were Westpac, or Red Cat, or Small Giants, or GPT, it was the perfect Christmas gift. They are actually real partners with STREAT, so then it's very easy for them, and it's very correct and true for them to give that book to one of their staff, customers, clients, and say well we support STREAT, and these are our Christmas gifts to you. Prashan: With twenty- to twenty five grand under their belt, the task seemed more manageable, but STREAT had one more trick up their sleeve. Rebecca: So, what we were doing is sitting down as two partners, rather than sitting down as just a landlord and a tenant. They were wanting to make the relationship deeper because they already knew that we were adding a huge amount of value to their business. So, we could have the conversation and say, "Well, what else are we bringing to the relationship? This is not just a lease agreement. If you are asking us to sign up for five years here, what are we doing together? Prashan: GPT’s response? You know that crowdfunding campaign you’re running - if you hit your $40,000 target, we’ll give you another $40,000. That’s $80,000. Enough to get their café. Now all they needed to do was to sell enough cookbooks. Now – we’ve run thousands of campaigns on Chuffed.org – and $40,000 is a big target in Australia. Go back a few years, when crowdfunding wasn’t really a thing – and $40,000 in social cause land was unheard of. Plus, STREAT were running an All-or-Nothing campaign, which meant if they didn’t hit that $40,000 target, they’d get nothing. No money. No cookbook. No café. Rebecca: Yeah, it was quite nerve-wracking actually because we'd decided to go for a three-month campaign. And that's a long time. Like that's a really, really long amount of time to sustain a sense of immediacy and urgency. And what we knew is that you don't just kind of launch and then kind of cross your fingers. That you've really got to be feeding the campaign, you got to give it content. You got to be saying thank you to people. You got to keep a momentum. And that momentum, it's easy to watch a campaign and assume that somehow it just starts fuelling itself along the way but you've got to keep fuelling that fire as well. So I remember the amount of work that we were doing on social media or things just to keep it going. I remember having a shot at trying to get some celebrities involved by tweeting them and saying, "Hey, such and such. Have you heard about this? Can you re-tweet it?" But we didn't get any of those celebrity endorsements stuff. I think at the time, from memory, I even tried some, I think actually Kevin Rudd was really big and being the social media hussy that he always was. Rebecca: So like imagine if we could get Kevin Rudd to support it? But that never materialized so we certainly wouldn’t have built a campaign around the hope of that, even though we were holding at right to the end, thinking that someone might, some big celeb might get it. But we'd done a lot of pre-work to just try and make sure that it can get to that $40,000. Prashan: Despite the social media hussies not getting on board, STREAT were doing ok by the middle of the campaign, but they were by no means home. Rebecca: I still remember being weeks out, and thinking, "Holy crap, I hope we make it." Even with that pre-work, we were still working hard to the end. Prashan: And then, that magical day. The day they got to 40,000. Rebecca: Oh, my god. So it wasn't far from the end of the campaign and I just remember the immense relief like, "Oh, my god. I was relieved." And I remember writing an email out straight away to everyone. Just everyone that we'd ever spoken to before and everyone on our database, and just thanking them, and saying, "We've done it." There were a lot of office high five-ing. Yeah, it was a really good feeling. But then we just had to get on and build the damn site. So the campaign may have been successful, but then, all the hard work of actually building the site was starting. So it really was just chapter one of what was going to be a couple of the other big chapters as well. Prashan: That campaign was now over three years ago – and in many ways it set the precedent that every social enterprise crowdfunding campaign would follow. It’s now completely normal to use a campaign to pre-sell product to pay for your setup cost – it’s what nearly every social enterprise crowdfunding campaign does. But being at the forefront of anything is tiring. I was curious, now that it had been three years, what Bec had took from the whole experience? Did the highs and lows of the campaign turn her off crowdfunding? Rebecca: As the chief fund raiser for the organization, I think I've got a pretty acute understanding of how hard it is to get every dollar. And so, it wasn't like we got to the end and I thought, "Geez, let's do heaps more of them and because they're a lot of work." But, so is selling a million coffees to make money, so is writing masses and masses of grant applications. So, what it probably did is just give me in my little tool belt of understanding of how different types of capital work, it just gave me another little tool in that tool belt to understand, "Oh, so that's how that type of money behaves." All the things that you've got to do to get that, to make something like that work. Rebecca:. The other thing that was really positive though about it was, I think I had underestimated how much a crowdfunding campaign could give you visibility as an organization. So, it wasn't just about the dollars that were coming at the other end. What you were doing is, you were creating a story and an energy around your organization. So I think, what happened is not only did we end up at the end with a new café, but they were a whole bunch of people who, even if they didn't donate to the campaign, because we got some really good media about it, they saw us. They heard about us. And if you're thinking about the average person is probably going to need to hear about you five to seven times before they actually open their wallets. It's one more of those times that might be the first time they hear it but they're hearing it in a way that's got lots of energy around it. So for me, it's about getting the story really clear, but knowing that there's a lot of people that are going to see it that I aren't going to support it, but they are just part of planting seeds. All of them may, over time, become supporters. They're invisible now to you, but if you know that you got to keep planting a lot of seeds for any of those people to start to convert. Well, then, this is a really big way you can do that. The other thing is too that crowdfunding does. What it does is, it potentially starts to build a customer-base that might not have been there. So in our case, people that only ever had food with us they now had a cookbook that was going to sit on their shelves. All of our food's got a very short shelf life but the thing that we were creating had a really long shelf life. So, I'm interested when I go in to places. I've been into people's homes and seen our STREAT cookbook on their bookshelf, that's all stuff that's just there and visible. And I think about once again, it's just about planting seeds, that it's about creating an overall awareness of your organization in the campaign. A campaign can equally do that as it can bring about some funding, as well.